Sign in or join to like this review. 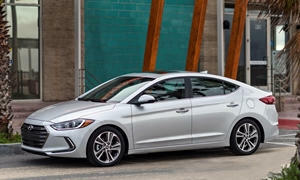 Elantra Limited/Ultimate package. Many luxury touches, like leather, memory power driver's seat, HomeLink, height adjustable front pass seat, full safety features (blind spot detect, lane watch, auto cruise control, front collision auto braking), even door handles that light up when you approach! And headlights that aim slightly when you steer to help see where you're going, which really help at night (earns IIHS top tier headlight ratings). Fun to drive. Not a dragster but more than adequate power. Smoothest/quietest ride in this class. Nice Infinity stereo. Like most others report, I consistently beat EPA fuel estimates-honest 40+mpg highway @ 70mph (even before fully broken in). Well designed interior and controls, like actual knobs/buttons for stereo & HVAC controls! Nav screen wel intergrated into dash & tipped slightly towards the driver (avoids sun glare). Passenger side dash tipped sl away contributes to most open feeling front cockpit in the class. Rear seat is wider than competitors, though slightly less fore-aft leg room than Civic. Big & versatile trunk with fold-down rear seats & big pass-through. Rebates & dealer discounts common so a HUGE value at actual selling prices (thousands US$ less than comparably equipped Civic). Longer (5 yr) warranty is icing on the cake. Nice. Not unique but not overstyled either. Flowing lines so easy to wash/wax. Not the fastest nor sharpest handling in the class, but a solid jack-of-all trades with plenty of unique-in-class luxury features in Limted/Ultimate trim. A very nice car to live with as your daily driver. See TrueDelta's information for all Hyundai models.